In the bowl of a stand mixer fitted with the paddle attachment, beat the butter on medium speed. Add the lemon juice and herbs; beat until combined. Using a spatula, fold in the julienned radishes. Season to taste with kosher salt. Serve with baguette croutons. Enjoy! Wow, I never heard of radishes and butter but it looks quite delicious! What a fun combination and I love the farmer's market website. I don't live near Chicago but have bookmarked the sight for inspiration. Thanks! P.S. Sounds like a lovely dinner! I love this recipe. 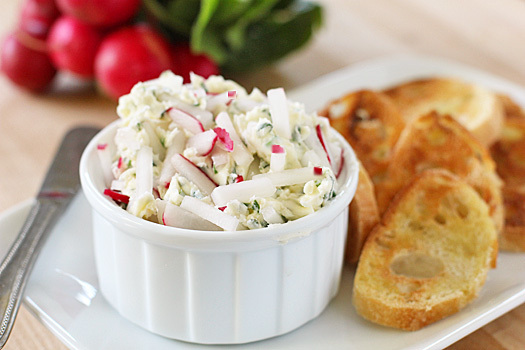 My mother used to mix radishes with farmer's cheese and a little more chives!! Also delish! My favorite sandwich growing up was white bread, butter and radishes with s&p. For me your recipe is a thrill from the pastb ut all grown up!